A city tour over homelessness sounds like something that could be exploitative. That was my first thought. How could a company or a person consider taking a group of people on a tour about the misery of homelessness? Even more, how can a company think that it is ok to charge a fee? The answer to these questions comes into focus when you start to explore the motivation behind the Berlin, Germany nonprofit querstadtein. The company was first started by Katharina Kühn & Sally Ollech. They both realized that everywhere they went in Berlin homeless people were to be seen. The numbers of those sleeping on the street seemed to be growing. Kühn and Ollech wanted to create a space where the divide between society and the homeless could be bridged. It was important that something be done to create opportunities for questions to be asked, assumptions to be challenged and ideas expressed. There are cities across Europe that already has city tours being given by homeless. I personally took one in Barcelona in February. 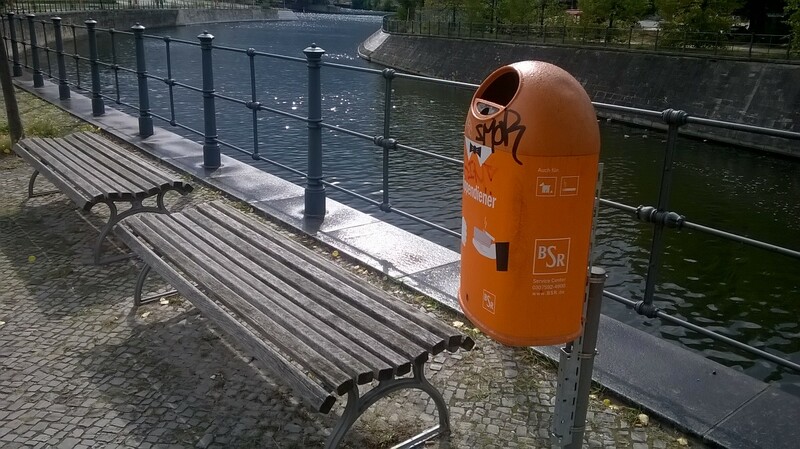 The founders of Querstadtein noticed that nobody created something like this in Berlin which hosts the highest number of homeless in all of Germany. They started talking with service providers throughout the city and the response was generally positive. They started slowly developing a business plan along with working full time jobs. As they built the network of partners, the stream of volunteers steadily grew to the point where there was a lot of hope and excitement around the idea. They met their first guides (formerly homeless) in 2013 and with them developed their first tours. The reaction was stronger than they could have hoped for and now with help from a local foundation they were able to hire a full-time project manager. I went to Berlin on September 20th to take a Berlin City Center tour with the guide Uwe Tobias. Full disclosure I took the tour in German so I cannot pretend that I understood or got every part of the tour. One thing that was striking about this tour in comparison with my tour in Barcelona is how in depth it went into Uwe’s life as a homeless person. We met by the main train station in Berlin where one of the many volunteers checked in the group of around 10-12 people who had gathered. The weather on this late summer Berlin day was predictably unpredictable. Even though it started to lightly rain as we waited, nobody deserted. The volunteer started by introducing us to our guide Uwe. After that, he provided us an explanation of homelessness. One German term is Obachlos which translated comes out to someone who is actually homeless or sleeping rough/street sleeping. The other term Wohnungslos roughly translates to someone who is without a rental contract. Although they may have a place to sleep sometimes, their situations are unsteady at best. These Wohungslos can also end up on the street from time to time. Uwe started the tour by taking us to one of the first stops of the tour which was a bridge on the river near the main train station. He pointed down to us where he used to spend time and sleep. He explained that this was a good spot because it was both covered and close to what in the time was a care shelter that he could find food in the morning. He then surprised me by demonstrating the different positions he would use to sleep on a nearby park bench when he was homeless. He showed us how he would manage pain from sleeping on one side too long and also demonstrated how he might maneuver his body to block a strong wind. He then told us how most homeless only get three to four hours of sleep per night because of the uncomfortable sleeping positons, street noise, harassment from police on occasion and or other types of street danger. 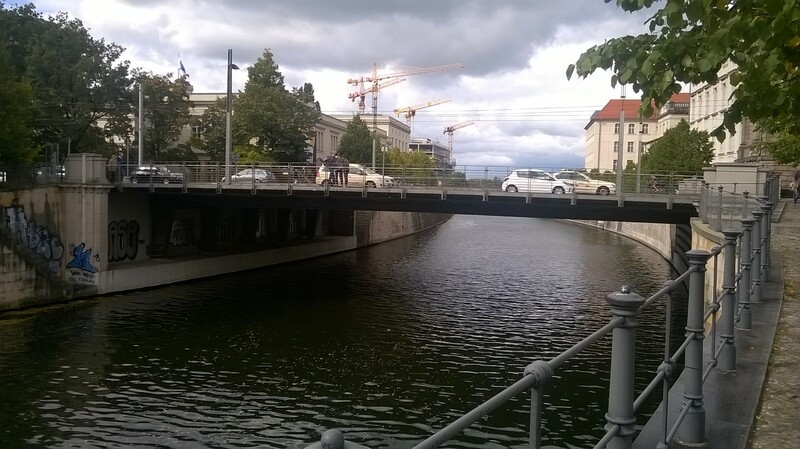 We moved on further to a part of Berlin that looked like it had recently been refurbished. Uwe pointed across the street to a building and informed us that it used to be abandoned. In those times, he along with other friends slept inside and made the place home for over a year. He seemed to drift off a little bit when speaking of his friends who he used to see every day. Most of them all were already dead. A hard life of living on the streets combined with alcoholism makes for a short life span. Uwe told us that he too used to be an alcoholic and would later explain what helped him give up that life. When someone asked him about why he left the building, he explained that reconstruction of the neighborhood meant that all the homeless in the building had to leave and find somewhere else to live. He pointed out other spots of interest as we walked showing us where he might have gone to warm up during the winter, or a medical center if he was sick. Many of the places he used to go are all long gone thanks to a highly gentrifying growth spurt that continues to displace many throughout Berlin. Our guide used this bench to demonstrate the various positions he used when homeless and sleeping on a bench. As we neared the end of the tour, we stopped in front of a place about a mile from Alexanderplatz a major square in Berlin. He told us about a few times where his blood alcohol limit reached up to four times the normal limit and he went into rehab. It was a stark reminder to him how close he almost died because of his dependency on alcohol. Uwe then pulled out a net from his pocket and explained how he used to keep spoilable food and drink from going bad by putting them in this net and letting them hang in the River Spree. He used the river as a refrigerator to keep cheese, milk and meat from going bad too quickly. Uwe’s explanation of day to day life living as a homeless person in Berlin really did give me the impression that living on the street truly is an art. The day to day life of being homeless means trying to keep your food from spoiling, finding the optimal places to sleep, positions to protect oneself from weather and soreness and knowing where you might find food or support. Uwe’s realistic and graphic description of his life as a homeless person really allows you to understand the stress, angst and pain of what it is like being on the street. On top of this, many people will walk right by you when you are homeless refusing to acknowledge you. A homeless person often becomes invisible. In the beginning of this, I asked the question how could a company create a tour that takes money to show what being homeless is like? The answer is by carefully and respectfully planning with dozens of homeless advocates, social groups and homeless persons to create an opportunity to knock down walls. It is clear the only person who makes money off of this idea is the homeless. The group has a strong network of volunteers and one paid project manager running the operation. The tour does give an opportunity for society to better understand what is happening when someone is homeless. Guides answered every question whether it had to do with family, dependency or other tough subjects. While a city tour over homelessness will not cure the issue, it does go a long way in helping people understand. Creating this opportunity for conversation and knowledge sharing is a valuable step in helping people understand. The more who people understand, the more likely bigger steps can be made in the future.